I’m so happy that I am still allowed to make Sunday dinners! Tonight was what I consider one of my best successes! Somehow we managed to skip right past fall and into Winter. There are three good things about this. My favorite three “s” words. Sweaters, soups, and stews. Mike and I have been on kind of a food journey. Looking for tasty alternatives that might lighten the meal up so we can still eat tasty food while shrinking the waist line. I’m currently obsessed with ground chicken, but back on topic…I have been looking at leaner red meats. Heard good things about venison and have been kind of wanting to try it for probably about a year. 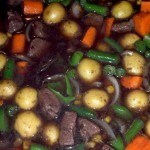 I decided I have a fabulous beef stew recipe and I would substitute venison for the beef. The problem? I went to the store and they wanted $24 a pound for the cheaper cuts ($45 a pound for tenderloin!) for the same animal I see at least 4 every day dead on the side of the road. Um. No. Oh, hey, look. Organic free-range lamb for $12.99 a pound. Sold. I don’t usually go organic, it’s just what they had at the store I was in and I was tired and it was vacuum sealed, exactly one pound, and labeled as stew meat. My beef stew recipe didn’t quite seem right for lamb. So I checked and found a lamb stew recipe that didn’t match all of the ingredients I had on hand. Okay, then. Combine! The broth from the lamb stew recipe seemed perfect. Red wine and beef broth (though I usually prefer beef stock). My beef stew recipe calls for beef bouillon granules and Worcestershire sauce. I had no problem with this so it stayed. It would add some salt and flavor. For the seasonings…I know what I like with lamb. Rosemary, thyme, marjoram, oregano, garlic. I went dry with everything but the garlic. Minced fresh garlic cannot be substituted in a recipe. Ever. I started the broth last night. I put everything but the garlic into a container and covered it in the fridge overnight. I don’t regret that decision. For vegetation. Any meat stew has to have potatoes and carrots. Sorry, it’s shameful to exclude them. I did a cup of carrots cut into just under 1-inch slices. I cut the thicker slices in half lengthwise. For the potatoes, I’m sure you can use any potatoes. But I found a bag of these really cute, tiny, lovely honey gold potatoes. Small enough to stay whole for the stew. The recipe I came up with called for 2.5 cups but I think that’s too much. I plan to scale back to 2 cups and further if I need to next time. I also used 1 small to medium onion sliced into the thinnest wedges I could safely cut. I also had frozen cut green beans and whole kernel corn, of which I used a cup each. I cut the lamb into roughly 3/4-inch cubes (I might go smaller next time). Most stew recipes have you brown the meat in hot oil in a large saucepan. This is fine, but I decided to kick that up a notch…I had some leftover rosemary-infused olive oil from a previous recipe. Um. YES. Worth the extra effort I promise and I’ll include that recipe too. Separate the meat into two batches. Brown the first batch in a Tablespoon of the oil, remove the meat, drain the fat, repeat with the second batch of meat. Put the meat back in the pan and pour in the wine/beef broth/spices/minced garlic mixture. Bring it to a boil, trying to scrape up brown bits from the pan for flavor. Once you have a boil turn the heat back and simmer for 20 minutes. It is going to look like overkill on the herbs. I thought I had screwed up. But once I added the vegetation after the 20 minutes? It worked itself out. I added the veg, brought everything back to a boil, then simmered another 30 minutes. You gotta check the potatoes. If the potatoes are done everything else is, I promise. After the 30 minutes the potatoes were done, but the stew was loose. Too loose. More of a soup. I took two Tablespoons of corn starch (flour tastes) and two Tablespoons of cold water and created a smooth slurry. I slowly stirred in the whole thing and the broth thickened nicely. I suspect it’ll be gelatinous tomorrow after being in the fridge all night, but it just needs to reheat. Serve with some warm crusty bread and you have a meal! The recipes (intended adjustments included)! Heat 3/4 cup olive oil and 1/3 cup 1-inch sprigs fresh rosemary in a small saucepan over medium heat until oil begins to bubble and an instant-read thermometer registers 140 degrees, about 2 minutes. Let steep at room temperature for at least 2 hours or cover and chill overnight (the longer it steeps, the more flavorful it will be, I did overnight). Strain oil; discard rosemary. Enjoy! In a large saucepan, brown meat, half at a time in hot oil (rosemary olive oil recipe to follow, otherwise just use your favorite cooking oil). Drain fat. Return meat to pan. Stir in beef stock, wine or stock, Worcestershire sauce, beef bouillon granules, rosemary, marjoram, oregano, thyme, bay leaf, and garlic. Bring to boiling; reduce heat. Cover and simmer for 20 minutes. Stir in carrots, potatoes, corn, green beans, and onion. Return to boiling; reduce heat. Simmer for 30 minutes more or till meat and vegetables are tender. Discard bay leaf. Turn off heat. Combine 2 Tbsp. cornstarch and 2 Tbsp. water, stirring until there are no lumps. Stir a little at a time into the finished stew until you’re out. Don’t go too fast, you’ll end up with one large clump in the broth. Make sure it’s fully incorporated before you add more.